(Original Post) We have had our IKEA Kivik couch for a year, and decided it was time to give it a new look. For only $30 we were able to give the couch a much more modern look. IKEA sells legs intended for bookshelves and cabinets. We added them to the couch and are very happy with the results. It took about ten minutes and really made the couch look a bit more West Elm! We used the Besta legs. They come in two packs and sell for $10. What color cover is that? Did you dye it a dark blue. I have a kivik couch as well and looking to update it! I think I will add the legs, it looks really good! It is the Dansbo dark gray. Adding the feet really gave it a higher end look. This one does not have the sofa bed. You should be able to do this in a model with a sofa bed. The key would be building blocks to place under the feet when the sofa bed is folded out, since adding the feet will raise the level of the couch. It could be as easy as using a few pieces of scrap wood or bricks (depending on the height). Let me know what you do! I would love to see photos, so I can share on my blog! Were the Besta legs difficult to attach? Was any retrofitting required or did they simply screw on? To be on the safe side I attached the legs with a lag bolt and nut instead of using the screw that was provided. I wanted to make sure it was really secure and would not break off when people were sitting on it. That process was very simple. Where the couch meets the chaise there is no place to attach a Besta leg. For that I cut a piece of wood to make a leg. 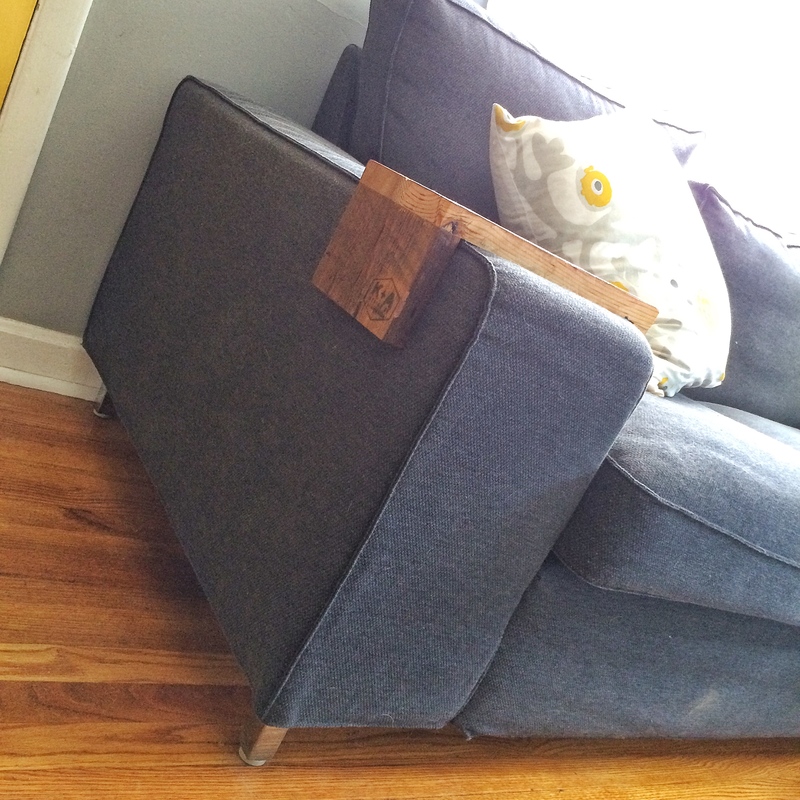 The woods fits into the metal piece that is used to attach couch to the chaise. Once the wood piece is in the channel I drilled a hole, so I could attach it with the existing hardware. This step took the longest since I needed to cut the wood a couple times to make sure the couch and the chaise were at the same height. Any chance you could give a little more information on this? I am not as talented at woodworking as you clearly are, but I am attempting to use new legs to slightly raise and upgrade the look of my own kivik loveseat and chaise. I can’t think in the way that you do in order to come up with a solution to take care of the part where the two sections meet, so everything I bought is still sitting in the closet. Any extra advice would be greatly appreciated. Where did you get those wood trays on the arm? They are lovely! I made them. I have had so many emails about them that we are soon to go into production to make them! looks awesome! Is it possible to just screw in the legs without doing anything else?